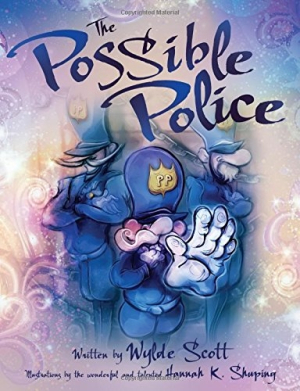 Dreamy purple and sunshiny swirls juxtapose with the dark attire of the authorities as the visionary protagonist of this book proves his creative superiority to enforcers of the limits of the imagination. Rainbows, stars, and smiling animals highlight the quixotic nature of this doe-eyed dandy. His poetic volley of dialogue with the officers reveals Wylde Scott’s talent for capturing the rhythm of creation through words, while Hannah Shuping’s spirited illustrations urge everyone to follow their fancy. Ages five and up.